Put the spring onions, potato and garlic in a large pan. Add a vegetable stock and bring to the boil. Reduce to a simmer, add a lid to the pan and cook on low for 15 minutes until the potato has cooked. Add the peas and bring the mixture back up to a simmer. Scoop out around 4 tablespoons of the peas and set aside to add to the top of the soup later. Stir in the spinach and yogurt and then blitz the soup until smooth. You can use a stand or hand blender. 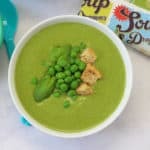 Ladle the soup into bowls and add some of the reserved peas to the top. Serve with some croutons or crusty bread.